When we got there, there wasn’t much in the way of promotional materials available for this thing, and when we ordered one of the items off the Gastro Pub menu there wasn’t a mention of any recommended drinks. The food made up for the apathy, though. 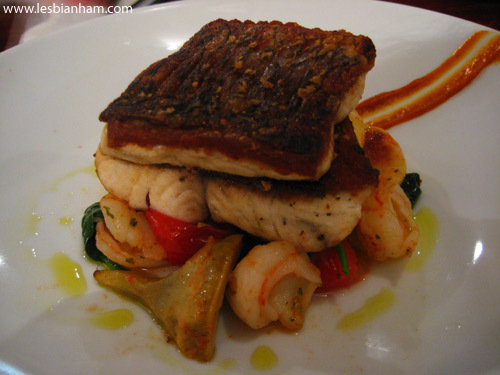 My pick – “Roast barramundi, confit dutch cream potato, cherry tomato, artichoke & prawn salad w/ tomato jam”. 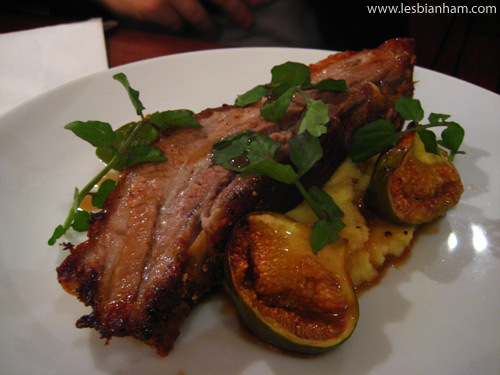 This was delicious, the barramundi was perfect. This is also the shittiest photo I took of that night. I forget what this is and it’s not on the Riverview website. 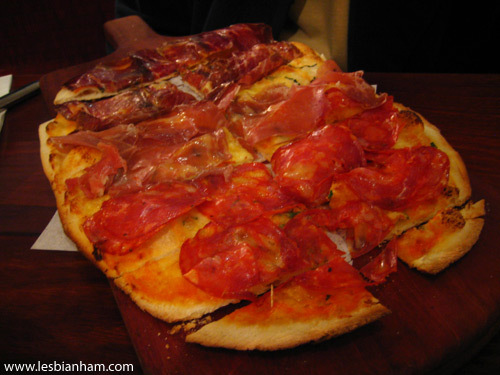 It’s a pizza with three different sorts of cured meat. I’m pescaterian this week and didn’t partake (let’s not worry about the bite I took off Rob’s plate). Ross said it was delicious, though.